To design, validate, and promote the use of advancements in monitoring the exposure of miners to respirable dust, respirable crystalline silica, and diesel particulate matter. Overexposure to respirable crystalline silica (RCS) can lead to the development of silicosis, which is a disabling, irreversible, and potentially fatal lung disease. The U.S. Mine Safety and Health Administration (MSHA) has an RCS permissible exposure limit (PEL) of 100 µg/m3, and the NIOSH recommended exposure limit (REL) is 50 µg/m3. Based on MSHA data, the percentage of samples from 2013 to 2015 that exceeded the PEL were 10%, 6%, and 5% for samples collected in metal, sand and gravel, and coal mines, respectively. In the same commodities, the percentage of samples that exceeded the REL were 23%, 19%, and 15%. Around 3,000 samples are collected by MSHA every year both in metal/nonmetal mines and in coal mines. In addition, the silica content in respirable dust has been found to be extremely variable in almost every mining commodity. One of the most significant hurdles in controlling exposure to crystalline silica in the mine environment is the inability to rapidly assess exposure. Using current analysis techniques, it may be weeks before results are obtained. This time lag makes it nearly impossible for the miner to associate specific work practices or mining conditions to high exposures, preventing the application of mitigation techniques or administrative controls before overexposures occur. To address this problem, one focus of this project will be to optimize and facilitate the implementation of a novel, field-based respirable crystalline silica monitoring approach for assessing end-of-shift exposure to empower health and safety staff and miners to avoid or mitigate high crystalline silica levels in the mine environment. This method has been preliminary developed in a previous Mining Program project, Monitoring and Control of Airborne Toxic Substances in Mining. In the current project, the implementation of the new monitoring approach will be tested in a new effort to use advanced monitoring techniques to identify and develop effective control technologies and workplace practices. New dust sampling cassette (after use) developed by a manufacturer in collaboration with NIOSH. This cassette facilitates the analysis of dust on the filter and is optimized for the field-based silica monitoring approach. Photo by NIOSH. One anticipated outcome of this project is the adoption of the field-based silica monitoring approach by health and safety professionals in the mining industry in both coal and metal/nonmetal. That adoption is now facilitated by a new dedicated beta version software developed by NIOSH called Field Analysis of Silica Tool (FAST). The FAST software includes algorithms optimized for the silica analysis of samples collected in coal mines. The approach and software can also be used in other mining environments, creating ore-specific quantification models. The project team is continuing to work on the development of the analytical monitoring approach which will ultimately be submitted for consideration as a new NIOSH analytical method. The project team has also collaborated with a manufacturer on the creation of a new dust sampling cassette, specifically designed for the field-based silica monitoring approach and now commercially available. As a second anticipated outcome, this project is performing case studies at aggregate operations in which the field-based silica monitoring approach is being merged in conjunction with the Helmet-CAM assessment technology. The goal is to demonstrate the benefit of these advanced monitoring approaches for the identification and control of respirable dust and silica at mine sites and for increasing the awareness and engagement of companies, corporate health and safety offices, and workers. 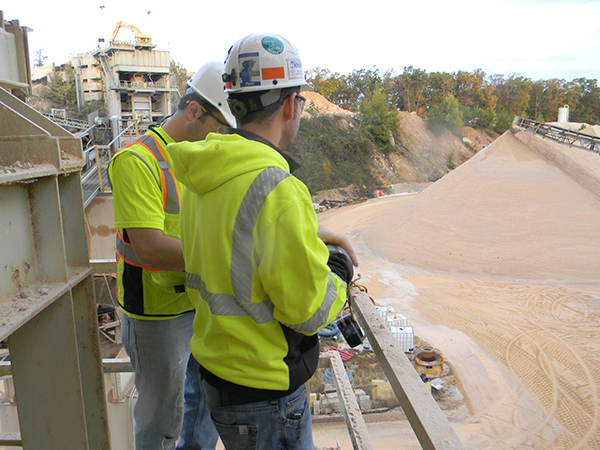 NIOSH researchers collecting area respirable dust samples at a sandstone mine to demonstrate the efficacy of advanced monitoring approaches such as field-based silica monitoring and Helmet-CAM. Photo by NIOSH. A third anticipated outcome of this project research will be to develop possible improvements to the commonly used NIOSH 5040 analytical method for samples collected in mining environments. Previously published studies have indicated that the current method used to sample diesel particulate matter (DPM) particles in the presence of respirable dust might have some deficiencies. In addition, NIOSH 5040 might need revisions when a sample is collected in a mine using biodiesel fuel, which generates a substantial amount of organic compounds. Finally, this project will also investigate new and modified coal mine dust sampling and monitoring devices. This investigation is part of NIOSH’s statutory obligation to approve new and modified coal mine dust sampling devices under 30 CFR 74. The Field Analysis of Silica Tool (FAST) software is now available as a beta version on the NIOSH Mining website. A press release announcing the software was published on the Occupational Health & Safety website on October 4, 2018. Lauren Chubb at the Annual Convention and Aggregate Miner Safety Conference, Illinois Association of Aggregate Producers, March 5-7, Springfield Illinois.